1) What’s is the high bay? And what’s the low bay? The LED high bay lights are the perfect energy-efficient indoor lighting solution for places with high ceilings, like warehouses, gyms, factory, exhibition and supermarkets. Compared to metal halide and other common industrial lighting technologies, LED lights to start up faster, last significantly longer, and are less susceptible to Lumens depreciation. 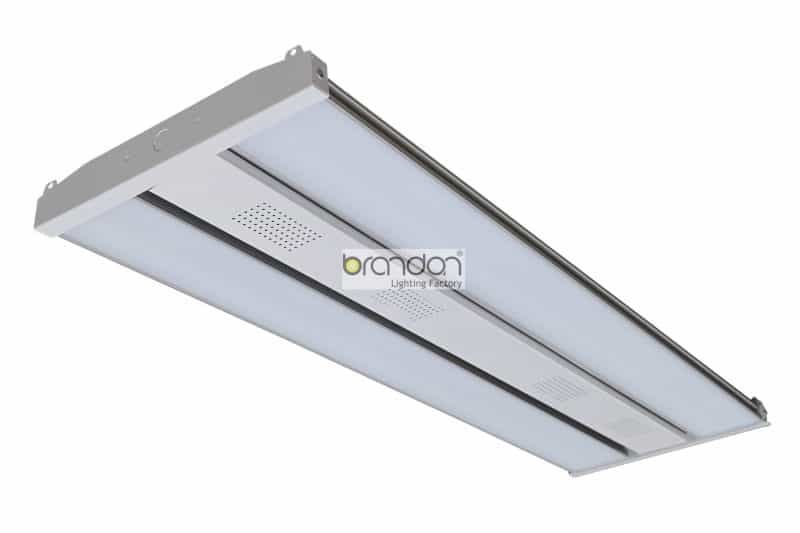 They are also much easier to dim or use with motion/occupancy sensors than HID or linear fluorescent. And then, of course, there’s the energy and energy bill—savings. From their name, LED high bay lights are used to illuminate spaces with high ceilings which ranging from 20 feet to approximately 45 feet. The LED linear high bay fixure have multiple applications across a range of industries, including workshops, factories and assembly lines. You will also see some LED linear high bay lights used in large recreational facilities and gyms. The high bay LED lighting are excellent for illuminating storage facilities and warehouses as well. They can be used for large conference halls, event centers, or indeed for any place that needs lighting from an elevation of more than 20 feet. They are even used in hangars and other large, cavernous buildings. 2)How many type of LED high bay available in market? 2) What’s the low bay? As the name you see, these bay lights are often used with lower ceilings in open areas. Low bay lights are often designed to illuminate open areas with ceilings between 12 ft to 20 ft. Anything lower is very uncommon in large open area facilities, and would otherwise require a different type of light fixture entirely. 3)What’s the difference between high bay and low bay? In short, the height in which these lights are used is the main difference in terms of their application differences. For technical differences, there are two main things: lumen output and how they direct their light. Commonly with lower lights, they will require less lumen output due to their nature to lose less light. Secondly, the reflector or lens angles vary greatly as different heights call for different direction and placement of light. What’s the benefits of LED high bay? LED high bay lights are more energy efficient. They use smaller watts of power than other lights and savings up to 80% can be seen in electric bills. They last for a longer time period and therefore need to be changed less often. Up to ten times the duration of other light bulbs. They do not heat up when they are on like other lights do. This can decrease the need for air conditioning by as much as 20%. Another way to save on the electric bill. They are more durable and withstand the test of time. They are very resistant to damage and are basically maintenance free. They do not break easily if bumped or dropped. LED high bay lighting is flicker-free, where fluorescent lighting, for example, can emit a great deal of flickering. Less light distortion is noticed with LED lighting. The static buildup is minimal with LED lighting. Light uniformity is greatly improved when high bay LED lighting is used. As much as 8% better light distribution is reported. High bay LED lights also distribute light more evenly than other lighting options. What’s trends of the LED high bay in the future? Increased efficacy: Rising LED source and optical performance is being leveraged by manufacturers to increase light output, reduce wattage, or both, resulting in higher efficacy (lumens/W). It is also contributing to smaller luminaires, which is contributing to a steady average decline in cost, as well as lower operating temperatures and longer life. LED high-bay luminaire are now available in standard and premium efficiency options. The most-efficient luminaire are recognized as Premium in the DesignLights Consortium’s (DLC) Qualified Products List, qualifying them for potentially higher utility rebates. More options: LED high-bay luminaires are available with a wide range of light distributions, CRI, and CCTs. Meadows said the most popular CRI continues to be 70, as it is not only suitable for a majority of industrial and warehouse applications, but also the most efficient LED chip package. Uplight: LED high-bay luminaires are available in inverted mounting for indirect lighting. Optical control: TIR optics enable greater optical control, which reduces glare while potentially reducing the number of luminaires required through control of the beam spread. Engle said there is a trend toward lensing for luminaires installed at lower mounting heights in logistics and warehouse buildings to reduce direct glare. Lighting controls: This is a major trend, with LED offering the ability to both dim and turn OFF loads when they are not needed either through scheduling or integrated occupancy and daylight sensing. While standalone sensors and hardwired circuit-level controls remain most common, wireless connectivity and digital communication are nascent but becoming more popular, particularly for flexibility in both retrofits and new construction. Many of the LED high bay can come with the PIR motion sensor or Microwave sensor. The usage of the sensor will help save more energy and expand the lifetime of the LED high bay products. Sensor-enabled high-bay LED light fixtures are the easiest way to reduce energy and transform your customers’ facilities for the future, and now are at a price and performance that make it a true no-brainer to switch to LED.